This thorn-free Blackberry makes a great addition to any fruit patch. 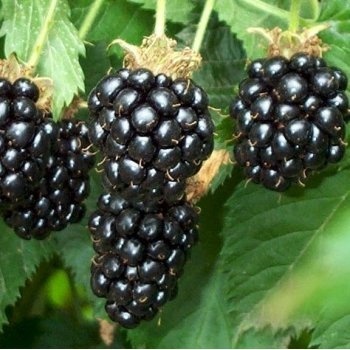 Blackberry Oregon Thornless produces good flavoured fruits on long thorn-free canes that are ready to crop in late August. It can be grown against a trellis or other support system and its thorn-free canes make it a friendly alternative to some of the thorny varieties. This summer flowering fruit has pale yellow autumn leaf colour and deeply divided foliage making it aesthetically pleasing too. Blackberry Oregon Thornless will grow in most positions, including those with poor drainage and partial shade. Blackberry bushes can be planted close together to create a ‘hedge’ of blackberries or as individual bushes at approx. 1m apart. When planting blackberry bushes, such as Oregon Thornless, it is important to prepare the planting area well. Pot grown blackberry bushes can be planted at any time of the year. Bare root blackberry bushes need to be planted between November and March. If you are not planting your bare root blackberry bush straight away, it is best to ‘heel in’ your plants. Dig a hole in an unused area of soil and pop the roots of the tree in, gently firming around. If you’re planting within a couple of days, you can untie the bag around the roots, water, re-tie and then store in a frost free garage or shed. Whether planting a pot grown or bare root blackberry plant it is important to prepare your planting site well. Start by removing all weeds and grass within a metre of your desired planting hole. Then dig a hole slightly deeper than your root mass and approximately 2x as wide. We recommend digging a square hole as this encourages the roots to grow straight as opposed to around inside the hole. To help your plant establish more effectively, we advise applying root grow (sprinkle in the hole for pot grown bushes or prepare and apply the gel mixture for bare root trees), especially if you have poor soil. Gently loosen the roots and place into the planting hole. Using 50% of the original soil and 50% compost (avoid multi-purpose), fill in the hole and firm around gently. Make sure not to bank the soil up around the collar of the plant as this can cause problems. Unlike other fruit plants, blackberry bushes are best trained using a post and wire system. Using two stakes at either end, secure several rows of horizontal wire approximately 30cm apart starting with the lowest wire 90cm from the ground. Ensure your wires are taught and train the stems of your blackberry bush horizontally so they create a fan shape along the wires. In autumn, cut back the stems which have produced fruit to just above ground level. Then in spring and summer secure new stems onto the wires. Tidy up any dead shoots in February.